I thought I’d reveal some plans that I have for The Runners Anthology. Yes, that’s still a thing. I know I haven’t talked much about it since I announced it a while ago. That’s because I’ve been debating doing something for it. I finally decided that I’d get your opinion. Please, leave a comment with your opinion on this matter. I really need it. When I wrote Runner last year, I had no idea what I was getting myself into. I thought that J.K. Rowling had nothing on me and my writing. I’ve taken some…no, a lot of hits and bad reviews because of how bad my writing was from Runner-Rescued. Those reviews were probably right. I cannot read Runner-Rescued, because of how bad the writing is compared to now. The story isn’t bad, but the way I presented it is. Wake and Eden, though, I’m very proud of, and think that the writing in those two is some of my best. This is were your opinion comes in. For The Runners Anthology, I’ve been debating wether or not I would re-write Runner, Caught, and Rescued, in order to bring the writing up to the level of Wake and Eden (or to The Enemy. Seriously, I’m so proud of it and how much better my writing has gotten even since The Intruders). Now, just so you know: THE STORY WILL BE THE SAME. EXACTLY THE SAME. So don’t be worrying that Adam’s name is going to change, or that I’m going to introduce some new characters, or anything. I’m just going to re-write it in order to flesh it out, make the dialogue better, and make it better overall. It’ll probably be longer, and better. I just want to have a product that I’m proud of. Don’t get me wrong, I’m extremely proud of it, but I want a product that I know is good, not just because I’m the one who wrote it. I want The Runners to shine, and the only way to do that is to re-write Runner-Rescued. I might re-write parts of Wake and Eden, but those will stay mostly the same. If I do it, once I’m done, the books are going to be professionally edited. I’m then going to un-publish The Runners, and re-release it as a stand alone novel simply called The Runners. I don’t want to do this though unless you guys are okay with it. As I said earlier, the story will be the same. The same people will die, the same things will happen, and it will end the same. It’ll just come in a much better package. And in paperback. Definitely in paperback. Maybe even hardback. Anyways, I just want your opinion on this. I’m torn. I want to do it so bad, but I don’t want to upset anybody. Thanks for reading, and please, please, please, comment. I know, I know. I haven’t posted a blog in a while! I’m sorry. I’ve been crrrrrrazy busy the past couple weeks. I thought I’d drop in real quick and let you guys know what’s going on. The Enemy is going very good! I’ve just wrapped out one of the sub-plots that carried over from The Intruders, but I’m not going to say which one! ;D Honestly, I love this book so much. Let me tell you, the ending to it is going to be crazy awesome! Every since the inception of The Intruders, back when it was known as The Arrival, I’ve always had the ending to The Enemy stuck in my head. Some people get songs stuck in their head, but me? I get scenes from my books stuck in my head, along with scenes from movies (like the ending to The Dark Knight Rises). The ending is going to blow you away, and cause you to question EVERYTHING! I can’t wait to write it, and I can’t wait for you guys to read it. Also, I’ve been outlining my next project, Porters! I’m not ready to announce what it’s about yet, but I can tell you that it will be serialized. Kinda like The Runners, but longer, and more frequent. I’m going to release the 20,000-25,000 word long episodes of season one every Friday for six weeks. I’m hoping to get started on that this winter, but it might have to wait until I’m done with the final book of the Visitors Trilogy, which is scheduled for release early-2013. I have a chapter of The Enemy that I want to post here on the blog, but I’m not going to post it yet! Why? 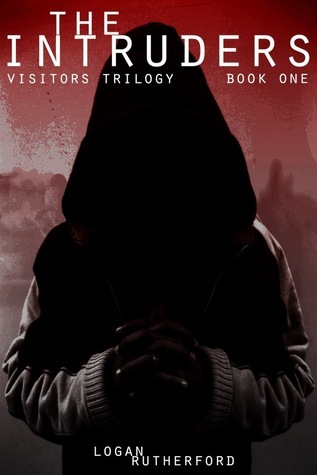 I’m waiting until The Intruders reaches ten reviews on Amazon! Right now it’s at eight, so if just two of you guys leave a review, I’ll post it. If you don’t know how to write one, just click HERE,scroll down to the reviews, and at the bottom, click Write your own review! Then just write a review (it doesn’t have to be long – just a sentence or two will do) then voila! You’re done! It helps me, and it helps you, because as I said earlier, once I get 10, I’m posting that chapter of The Enemy! If you want to win a signed copy of The Intruders, just click HERE to enter! Also, there’s that fancy little thing underneath me that’s show you all you need to know! Add me as a friend on Goodreads while you’re there! Giveaway ends September 01, 2012. Alright! I think that’s everything I have to say! Any questions? Leave ’em in the comments! Peace out, homie.